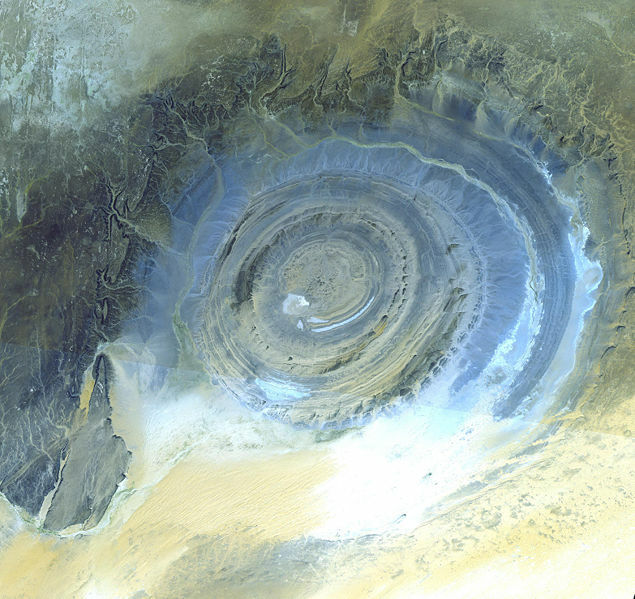 However, although to all intents and purposes it looks as if it could have been lasered in to the landscape the Richat Structure – (when not described as a bulls-eye it is called the outsized ammonite) is a completely natural phenomenon. Still unknown to many it gained the attention of the first astronauts because, unlike certain great walls, it is so very visible from space. 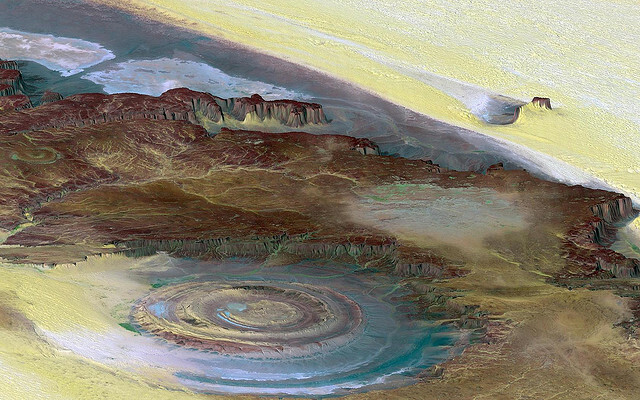 The Sahara Desert, in which the structure is situated, does look rather featureless from above. So when astronauts glimpsed this prominent almost circular mark – with a diameter of almost 50 kilometers – it piqued their interest. It has, since the early days of space exploration become something of a landmark for our planet’s space farers. 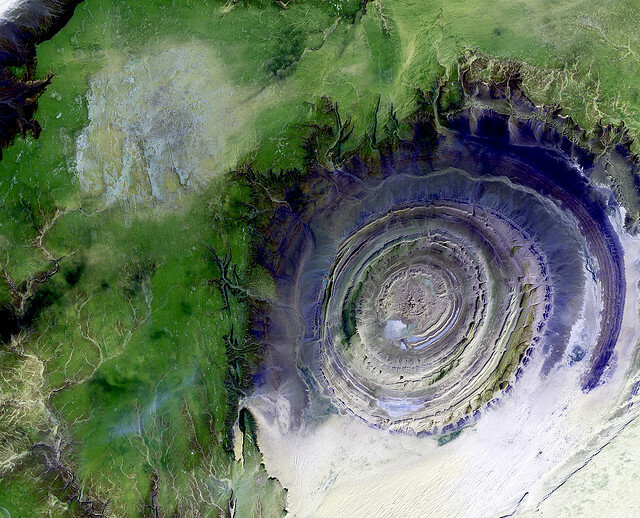 It is also occasionally called the Eye of Africa – and you can see why. It was for a number of years thought to be the impact crater of an ancient meteor strike against the Earth – as much because it has a high degree of circularity than any real scientific hypothesis. However, it is now thought to be what is known as a symmetrical uplift which, over the millennia has become visible (from space at least) due to the erosive effects of desert winds. 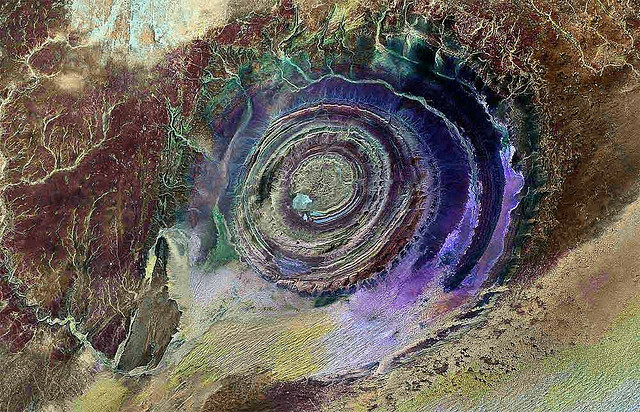 Geologically speaking the Richat Structure is known as a dome. 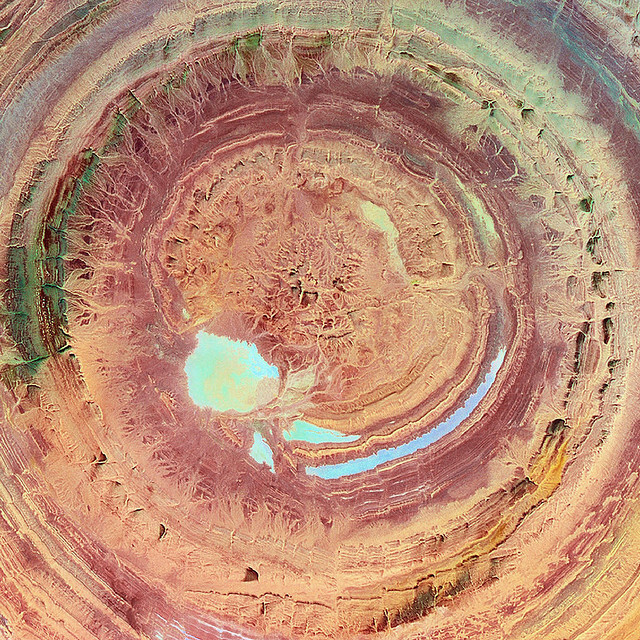 A dome consists of symmetrical but dipping anticlines. 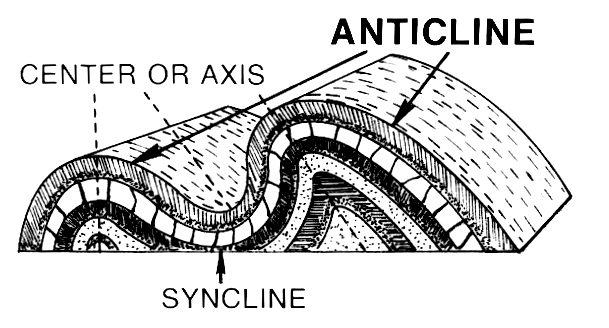 Put simply an anticline is a fold in the earth consisting of various beds with the very oldest at its core. Think of the top part of a babushka doll from Russia, with all the heads inside the largest one, get x-ray vision and you have a general visual picture of an anticline. As the millennia progress so various layers of the anticline are exposed by erosion – at least in the case of the Richat Structure. The rings you can see forming the ‘beds’ are made of Paleozoic quartzite which is between 200 and 500 million years old. 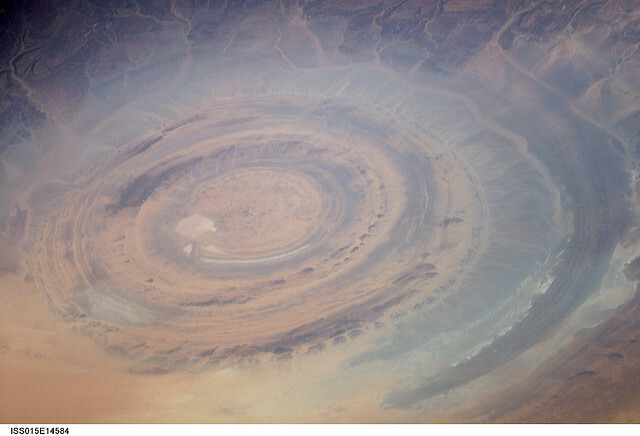 The dome explanation is thought the best – the lack of what is known as shock metamorphism (rock altered by the impact) at the structure puts a further dint in the theory that it was cause by a meteor. 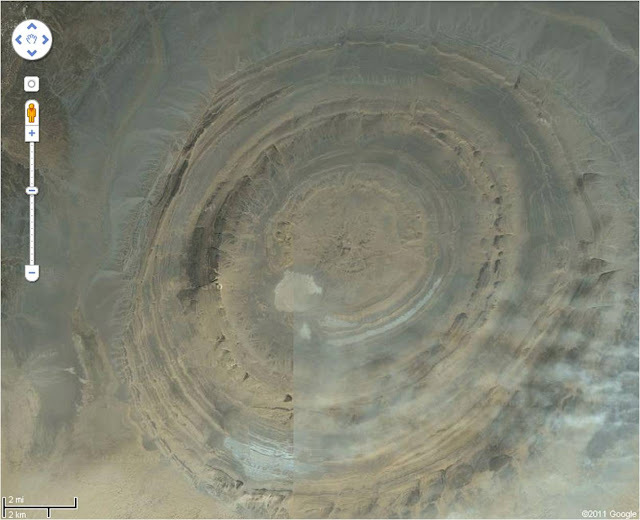 Legend has it that there is a hotel smack bang in the middle of the structure – yet that is a myth easy to disprove by simply looking at images of the Richat Structure. The ‘hotel’ is more a collection of wooden huts, there for the few hardy tourists who make it there and they probably sing We Don't Need Another Hero around the camp fire when they do. 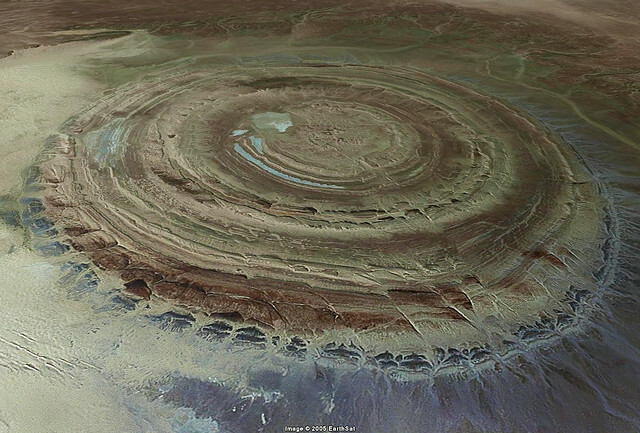 Why the Richat Structure is almost circular, however, remains a mystery yet to be solved.